Vibrantly-colored Kristina Tops adorned in the front with little rhinestone blings and strikes of white. Check out the striking printwork on those sleeves! Very light, breezy, and stylish made in a 50/50 cotton/poly blend for the season. Round neck, relaxed fit with 3/4 sleeves. This is our one of our few exception to all-cotton. Sometimes it's fun to throw a wrinkle in the mix ---- just to keep you on your toes! See Bust and Hip Measurements in Size Selections. Sizes S, M, L, XL. In two appealing fashion design color combinations. Mid-Hip Length. 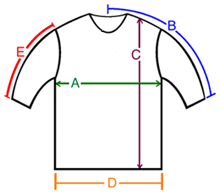 A: Chest / Bust circumference 36-38" 38-40" 42-43" 45-46"
B: Sleeve length from center of neck to end of sleeve 26" 27" 28" 29"
C: Body length from shoulder to bottom of hem 24" 24.5" 26" 26.5"
D: Hem circumference 42-43" 44" 46" 48-50"
E: Sleeve length from shoulder to end of sleeve 18" 18" 19" 20"
I found this new top to be just the perfect combination of soft, feminine, pretty and comfortable...So glad I got them in both colors. Thanks Kelly and Norma.